By the coil or by the skid, strapping from Fibers of Kalamazoo comes in a variety of materials, colors, and widths. 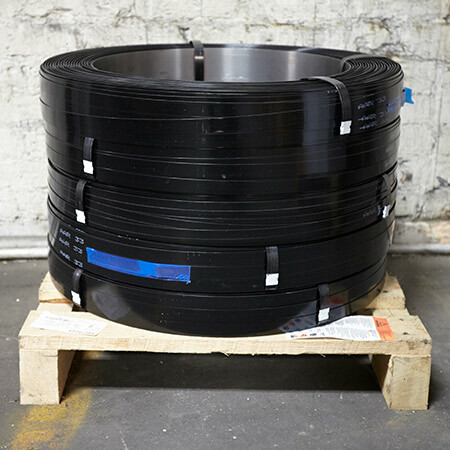 We carry regular and high-tensile steel, polyethylene, and polyester materials as well as tensioner and crimper machines, bail ties, clips, and buckles. Fibers of Kalamazoo has what you need to ensure your goods are bundled securely and without damage thanks to our strapping, tools, and accessories. 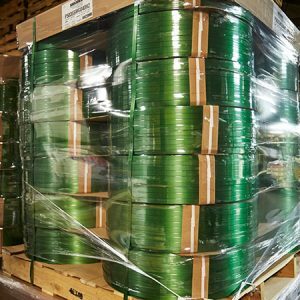 Fibers of Kalamazoo will find the strapping you need to secure boxes, pallet loads, and more. Check out our selection of stretch film, tape, chipboard, corrugated boxes, and a wide range of other packaging products! We also carry janitorial products, including cleaning supplies and paper products, to keep your facility tidy and presentable. Fill out the form below or contact us today for more information. Our knowledgeable sales staff is eager to find the best strapping and packaging products for your organization!